This Virginia Beach Engagement on the oceanfront is just the best! Luke and I love shooting Virginia Beach Engagement sessions! . A couple of months ago, Jon & Maggie drove from VA Beach to our new home and met with us before they decided to book. We don’t get that opportunity too often so it was fun to sit down with them and hear all about how they met and their story. I immediately fell in love with just how fun loving and laid back these two are. Once they booked us, Luke & I knew that we would approach their engagement session just a little bit differently. You see Jon & Maggie met while playing volleyball. They immediately hit it off and have been inseparable ever since. One key thing about their relationship is that they have this thing called Sunday Funday. Sunday’s are all about relaxing and having fun together. Rather that be volleyball, riding bikes, or having a drink at their favorite spot, Calypso on the oceanfront. They are even getting married on a Sunday! Their engagement session was all about Sunday Funday! We met up with Jon and Maggie at the oceanfront and started the session off with some volleyball. These two are both really competitive and I would love to watch them during a real game! Not only are they competitive, but they are seriously super cute together! I love the way they laugh and have fun. I believe that is such a huge key in a marriage, and they seem to have already got that figured out! We ended up on the boardwalk with them riding their bikes. Luke & I had to dodge out of the way a whole lot, but it was totally worth it! I also love Maggie’s spunky style that she incorporated in her engagement session. I mean Yellow chucks are seriously the best! The day had been calling for storms all day. For the last part of their session they wanted to grab a drink at Calypso. Rum buckets are their favorite! Because of the crowds and our kids, I decided to let Luke grab those pics while I roamed around with the kids for a few minutes. About 15 minutes later I returned and saw Luke was finished. We said our goodbyes and as soon as I hugged Maggie the skies opened. We literally couldn’t have had perfect timing!! Jon & Maggie, you two are seriously so much fun! We are so excited for you both and cannot wait to celebrate with you in July! 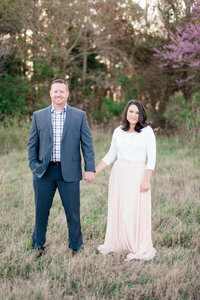 You can see another engagement session in Virginia Beach here!